Welcome to the Home for the Holidays Tour! I’m so happy you’re visiting my blog today…there are so many talented ladies in this group, you don’t want to miss any of their beautiful homes! And you’ll have the opportunity to enter our BIG Giveaway at the end of this post! 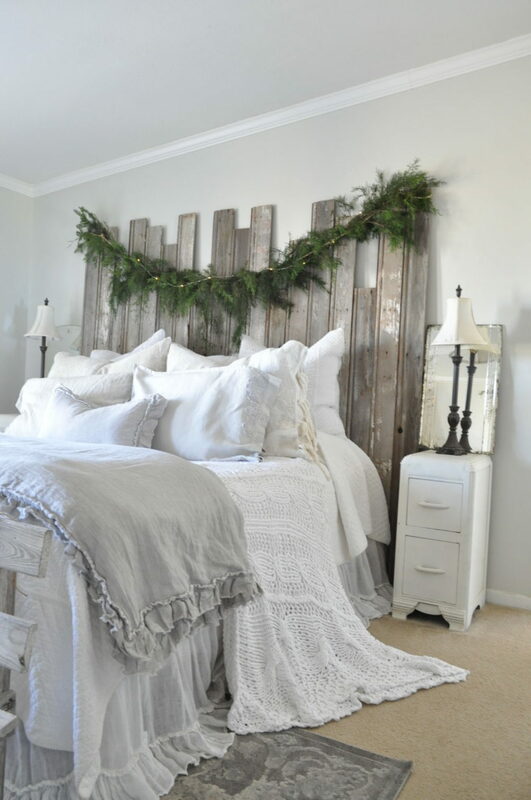 Today I’m sharing our master bedroom all dressed up for the Holidays. I used lots of fresh juniper branches and textures to make it feel festive. I love using fresh greens from our property, because there’s an endless supply…and it’s FREE! Who doesn’t enjoy free decor? 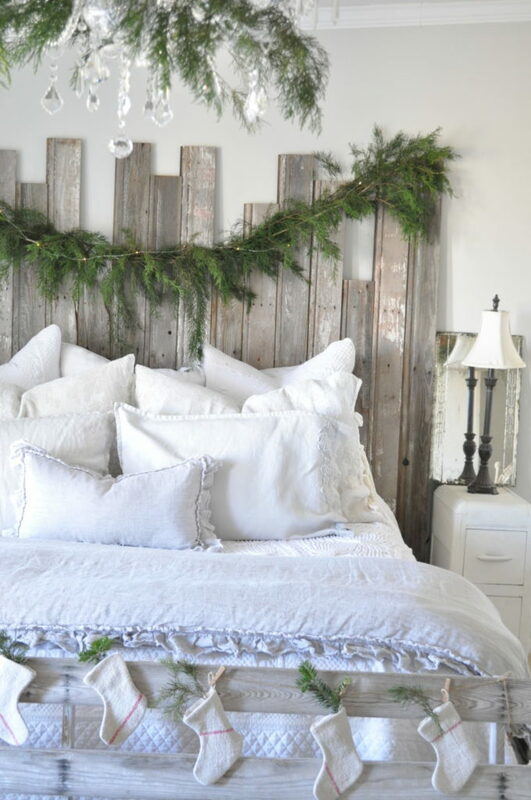 The garland on the headboard was a simple DIY using rope and twine. 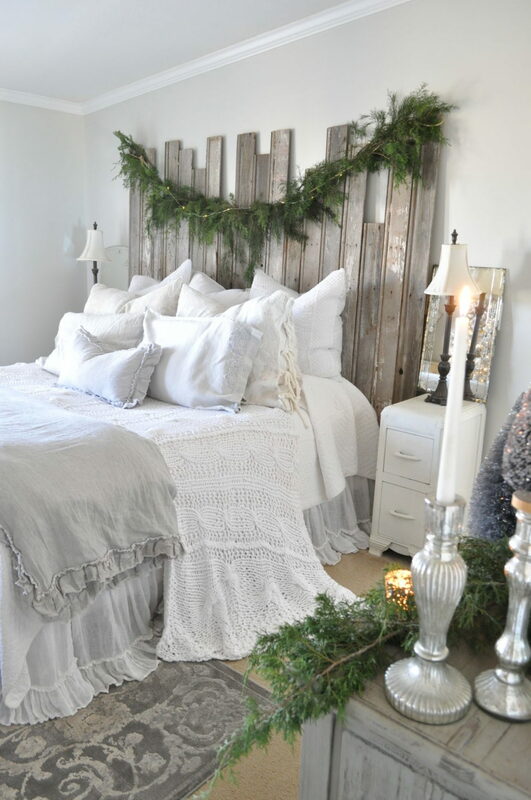 I just tied it to the headboard and placed branches on the rope. I tied the branches to the rope with twine to keep them in place. A strand of battery powered twinkle lights add a little glow. 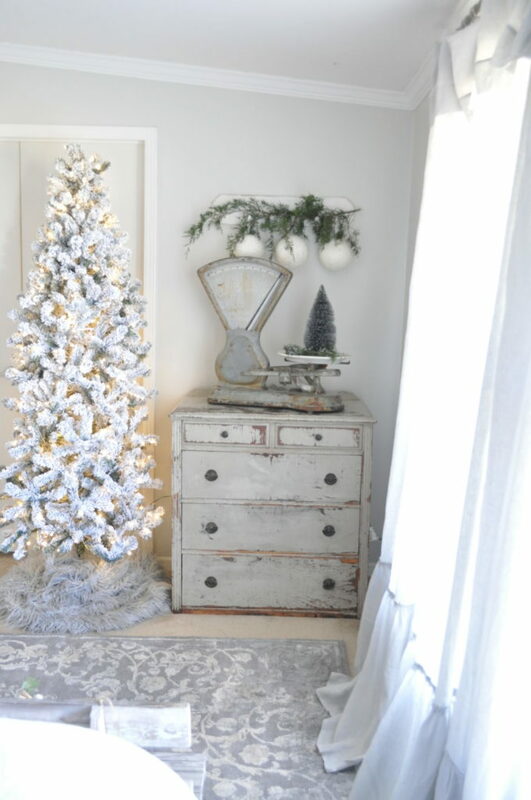 The tree is a 6ft Flocked Slim Prelit tree from King of Christmas and it’s a perfect size for the bedroom. I love the flocked trees plain. It makes a pretty glow without being too busy. This is our new dresser…the BECKY dresser from my Purple Rose Home Collection! And it’s the perfect piece for this wall in our room. I just love the details and vintage style. 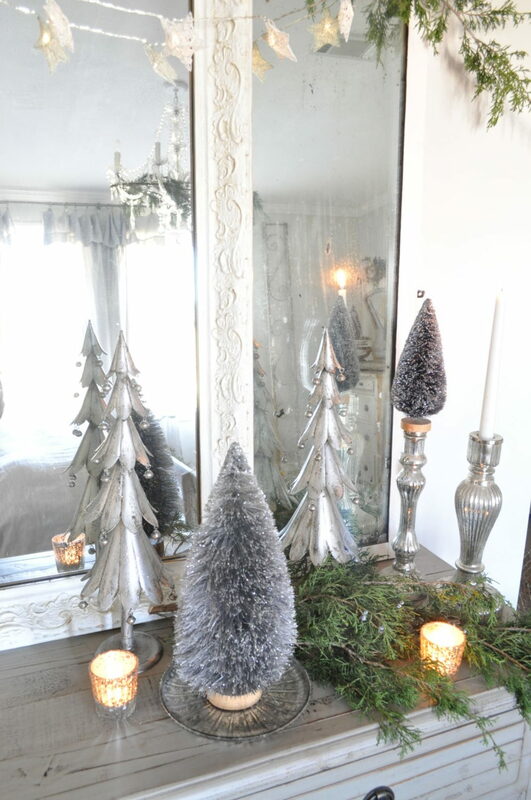 I put a few bottle brush trees from Target with my mercury glass candlesticks for a little sparkle. You’ll also find the cable knit blanket and gray throw in my PRH Collection HERE! 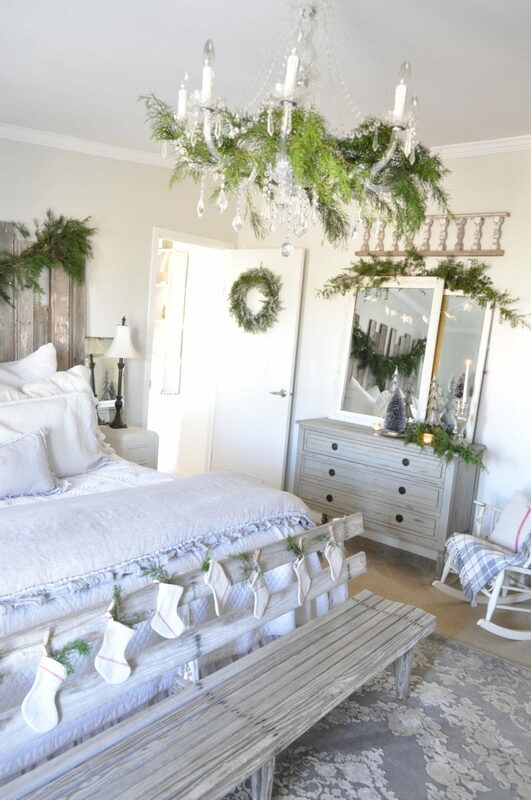 I added pieces of juniper branches on the dresser, armoire, and even the chandelier! 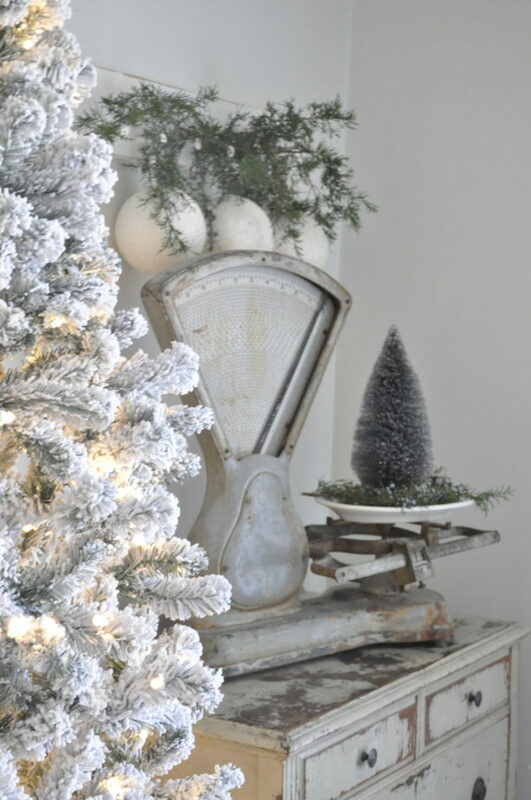 I love the pop of green mixed with all the white and gray. I got the grainsack stockings a few years ago, and they’re always a favorite! 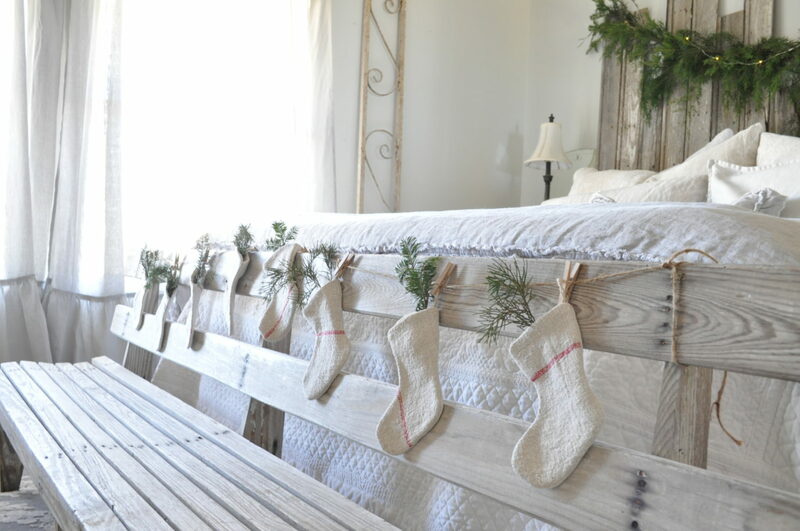 This year, I made a garland on the bench at the end of the bed with them. I put tiny clippings of greenery in each one. 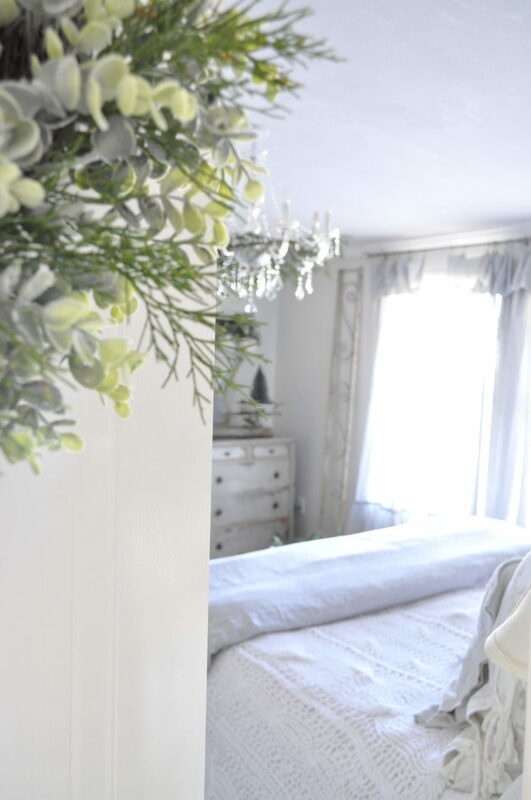 Well, I certainly hope these ideas inspire you in some way…and you’ll find so many more lovely home tours below. Be sure to visit all of my blogger friends, and remember to enter the giveaway at the end! 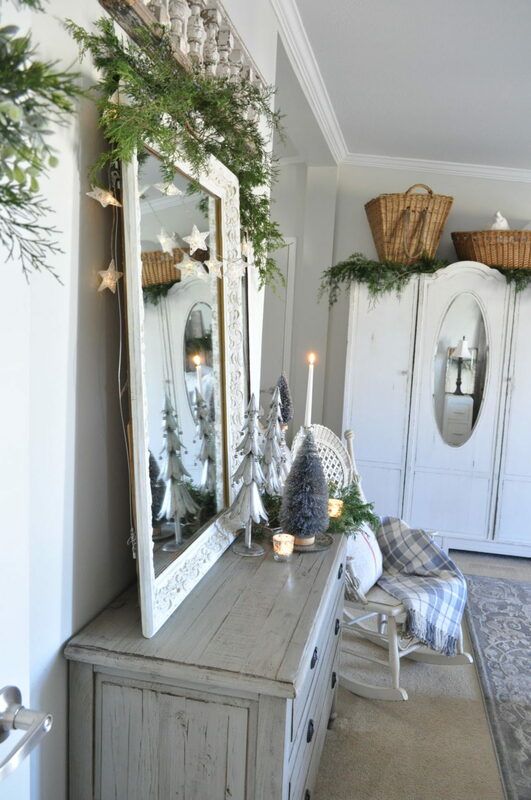 Today I am honored to join forces with this fabulous group of bloggers to bring you the Home for the Holidays Tour! 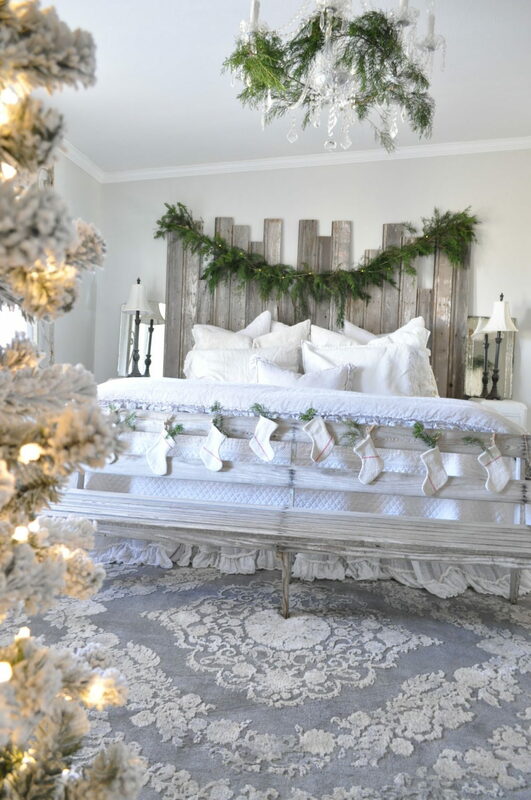 As I tour your most enchanting bedroom dressed for Christmas, the song of Silver bells came creeping into my head!…I Love the elegance of silver and white and your room is truly exquisite From the wonderful details to the gorgeous layering of your bed linens!…Merry christmas to you and your family!!! Becky your home looks so beautiful and festive. Here’s wishing you and your family a very merry and Blessed Chrismas!!! Your bedroom is beautiful, Becky! I love the greenery everywhere. Love all the vintage details. Merry Christmas!